I'm a little late posting this out, but don't worry - if you haven't already heard about - you still have some time to see your a few of your favorite acts (and by "a few" I really mean a ton of incredible people). And yes. There is an After Party. AEG LIVE, SM ENTERTAINMENT and POWERHOUSE are proud to present SMTOWN LIVE ’10 WORLD TOUR featuring top Korean Stars BOA, KANGTA, U KNOW, MAX, SUPER JUNIOR, GIRLS’ GENERATION, SHINee, f(x), ZHANG LI YIN, TRAX and other SM artists. 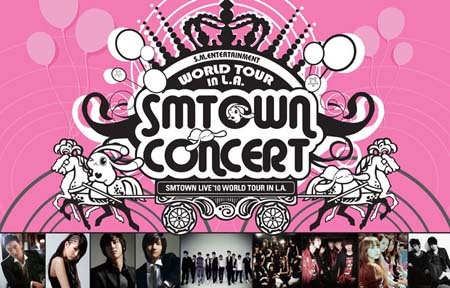 This concert is apart of SM Entertainment’s world tour project, which begins in Seoul and then continues onto LA, Tokyo, Shanghai, and other major Asian cities. This will be the first time that AEG LIVE, one of the largest concert promoters in the world, will be hosting an Asian concert at the STAPLES Center (1111 S. Figueroa St. Los Angeles). The SMTOWN LIVE ’10 WORLD TOUR will go beyond Asia and take place globally as a grand music festival featuring top-notch Kpop idols from SM Entertainment which is one of the largest artist management agencies in Asia. With STAPLES Center being the Sports and Entertainment Center of the World, the Los Angeles show will create an unimaginable experience and compelling atmosphere that people of all ages will enjoy. This highly anticipated event will be expected to sell out to thousands of fans who have been anxiously waiting to see these stars live. The SMTOWN LIVE ‘10 WORLD TOUR Official After Party will take place from 10:30pm – 2am, across the street at the CONGA ROOM (800 West Olympic Boulevard, Los Angeles) sponsored by Kollaboration, Yesstyle and SM Entertainment. VIP as well as general tickets will on sale to the public with prices starting at $55. All performing artists will be in attendance.